For many years we have seen a decline in the materialism of old and a progression toward something quite different. Many Americans and others around the world are placing a much bigger emphasis on experiences over things. Several studies have supported the result of happiness achieved through experiences versus acquiring products, and this can have an impact on retailers that aren’t paying attention to this trend. Should retailers be focusing on introducing experiences within marketing? If so, how can they do that, while still selling products? A substantial study conducted by Ryan Howell, Ph.D., an assistant professor of psychology at San Francisco State University, released in 2012 indicated that people tend to be happier with experiences over products. Actually doing things such as vacations or concerts spark long-term happiness in a substantially superior way over simply purchasing things like a new digital device or those shoes you really liked. The surge in interest in owning a tiny home is also a less scientific example of the desire for experiences over things. A large population of people of all ages and backgrounds are choosing to spend far less on a home with dramatically less space and prestige, in order to spend their money and time traveling and experiencing things. The fact is that 15% of 18-34 year olds would definitely live in a tiny house and 19% said that they’d seriously consider a tiny house instead of a traditional home. To be clear, we know that people are still interested in the latest technology gadgets, designer clothing and other pop culture products and services that exceed necessity. What we are seeing however is that a movement away from the old impulse purchasing that was thought to bring happiness is dwindling rapidly. The mentality that things equal happiness or that the latest new car, the biggest house or the more expensive dress will make you happy over taking the mini-vacation or going to that concert you always wanted to see live seems to be a thing of the past for many. Keeping up with the Jones’ might now be more about having the best experiences. A large amount of people are definitely beginning to spend their money on experiences versus the product driven economy of the past. This doesn’t mean that nobody is buying anything or that retailers will cease to exist. Nor does it mean that all material retail items are going to be extinct anytime soon. It does mean that retailers should be taking a different approach in many ways. B2C retail brands should better understand the experiences priority trend and make adjustments within their marketing, messaging and content to address it. Regardless of the experiences people are prioritizing in their lives, they will still need things in order to have those experiences. In other words, you need things to have experiences and therefore your product messaging and marketing should focus on how your things make your customers experiences better, how your product improves their well-being and provides value into their personal lives. We discussed this recently in one of our fondalo.com posts called Good Content Is Meaningful Content, and it ties in quite well here. Example 1: Let’s say that your company sells luggage. Rather than creating content that focuses on the features, benefits and pricing of the luggage, instead focus on the experiences surrounding using the luggage that you sell. Through content, show the travel, fun and experiences that your customers would have if they purchased your luggage. Create content that gives them examples and suggestions for getaways, trips and travel destinations that your luggage would help them experience. This addresses their intent on spending money on experiences and shows how your products help them get there. Example 2: Even if you are a local restaurant, you should be able to focus in on the experience centric trend that many consumers are transitioning to. Transform your marketing and messaging to surround the experience that your restaurant offers and make it part of something bigger for your customers. For example, you could provide specific evening out guides that incorporate your restaurant as a portion of that night out experience, rather than just promoting your food as a thing to acquire because it is “good”. Instead give your audience your food and atmosphere as something that they could include in a night on the town to make it more enjoyable. Example 3: Maybe your retail business sells home improvement products like flooring, carpeting and countertops. It would be extremely important that you focus your marketing, messaging and content on both the product advantages as much as the improved experiences that they bring when installed. This is a bit far from the experiences over things, or the minimalist lifestyle, however it still connects with the experiences priority trend in that the importance is on the resulting experiences from the product that is being purchased. Rather than focusing on product marketing that we know does not achieve long-term happiness for consumers, the experiences that are possible from the improved home, upgraded flooring and kitchen remodel certainly can result in happiness. Retailers should be taking heed to the trend of experiences over materialism. Consumers today want to experience things that improve their lives, increase their happiness and reduce their spending on products. Connecting your products to the experiences that your target audience are interested in, is how retailers can make deeper connections with their customers and provide value beyond the products that they sell. This connection has the potential to build brand loyalty and achieve additional revenues when it is done properly and your customers interests are taken seriously. 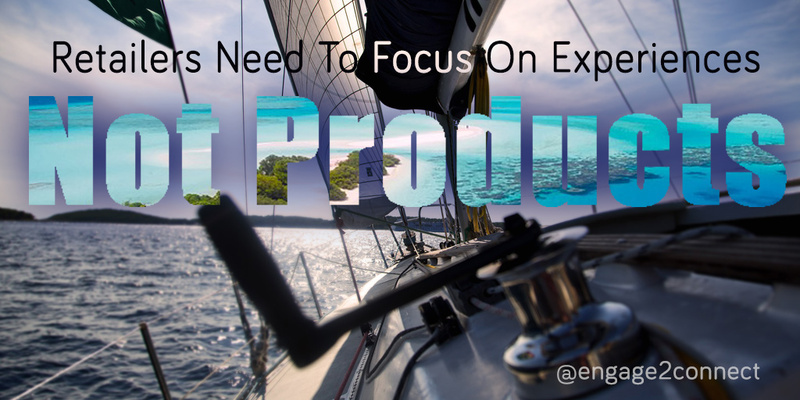 How are you modifying your marketing effort to focus on experiences over things?